Use this page to report a situation or design that violates competition terms, intellectual properties or that could result in social outrage or learn more about the Dispute Resolution process. Do you think a design has been “over inspired” by another design? Is your design listed as a winner but your name is not included? Did someone or a company join the competition with your design without quoting your name? Did someone used your patented or copyrighted design or idea? Is there a sensitive issue? Is there something that need urgent attention? If so report a situation. To report a situation simply contact our support. Alternatively, you can also initiate a design dispute. A Design Dispute is a situation where a party accuses another party for breach of intellectual property rights or plagiarism of design. There are two parties in a Design Dispute: 1. Claimant, i.e. the party making the claim, 2. Respondent, the party who is accused. There are 3 Levels of Dispute. 1. Situation, 2. Mediation, 3. Arbitration. Please kindly note that all design disputes must be initiated by the involved parties. Requests by delegated persons, lawyers, solicitators will be ignored; dispute processes must be made by real persons or entries involved. If you are law firm, please kindly contact your client to initiate the dispute process. To help the Pre-Selection Committee deal with the thousands of entries submitted, an artificial-intelligence software was written which checks the entries for technical issues such as pixel sizes or resolution of images, length of text fields etc. This is called the Advanced Submission Optimizer, and will check your entry for thousands of different technical issues and create a report to help enter your works correctly. The utilization of this software is free of charge and available after registration. The Advanced Submission Optimizer software does not have the right to judge your work or determine if your design is inspired or similar to others work, in order to avoid false negatives. Furthermore, while it is potentially possible for the award jury to detect if a design is over inspired or not, especially for famous designs, it is not possible for the award jury to know about all of such issues or designs, thus even though we have a functionality to report intellectual property related issues during voting, it could be possible that none of the jury members would highlight the particular design, thus a situation could arise that a priory patented or copyrighted design announced as a winner. Furthermore, more often, the award winning work could actually be the legitimate work, and the claimant work could be an unintentional copy. Moreover, there are cases in which the design is not a copy, i.e. the designers submit it to award, but the copyright owner or intellectual property owner is no longer the designer; for example if the designer had priory sold this work to another company. In addition, it is also possible to have cases in which the award winning work, even though seems to be a copy, could have been patented or registered since it would be legally different enough. To help the Pre-Selection Committee deal with the thousands of entries submitted, an artifical-intelligence software was written which checks the entries for technical issues such as pixel sizes or resolution of images, lenght of text fields etc. This is called the Advanced Submission Optimizer, and will check your entry for thousands of different technical issues and create a report to help enter your works correctly. The utilization of this software is free of charge and available after registration. The software does not have the right to judge your work or determine if your design is inspired or similar to others work in order to avoid false negatives. Furthermore, while it is potentially possible for the award jury to know if a design is over inspired or not, especially for famous designs, it is not possible for award jury to know about all of such issues or designs, thus even though we have a functionality to report intellectual property related issues during voting, it could be possible that none of the jury members would filter a particular design, thus a situation could arise that a priorly patented or copyrighted design announced as a winner. If there is no solid conclusion of the Situation or if there is not a quick solution, then Mediation takes place. 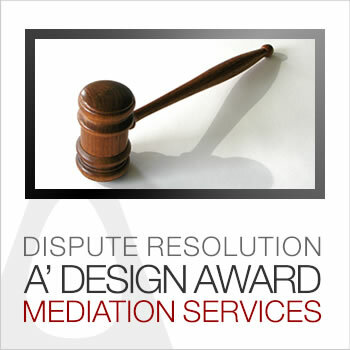 A’ Design Award & Competition contacts both parties for resolution, trying to reach a win-win situation for both parties, to do so, an offer / quick action suggestion is made. There could also be cautionary actions. If the Claimant (and/or the Respondent) agrees with the Mediators’ offer, then a resolution has been found. If both parties (Claimant and Respondent) both do not agree with the Mediators’ offer, then the issue should ascend to Arbitration. There are no fees or costs involved. The offer depends on the situation, sometimes we could simply ask the Respondent to kindly add the “designer name” to team-member list (in case where companies do not type designers’ names for example), and in other cases we could ask the Respondent to withdraw his application (plagiarism claims) or to update the description by citing the Claimants’ work as inspiration (in case of built upon works), the Mediator could also offer benefits in forms of free A’ Design Award & Competition services to the Claimant to help achieve a positive result. For example the Claimant could be offered a single or multiple free participation possibility with express evaluation to promote his works in exchange for not pursuing the Situation against the Respondent. A formal, offer acceptance response shall be sent to support@adesignaward.com email address. The email should include your name, and the text “I accept the offer”. These are the actions that could be undertaken by the A’ Design Award & Competition. For example, the Respondent could be forced to provide additional proof of validity to Claimant. Award category of the Respondents’ disputed work could potentially shift to hidden category during the Mediation step. Both parties also receive a copy of this particular communication as part of Cautionary Action. The Mediator contacts the Arbitration Jury, and send them the Claims and Responses, as well as the “Verdict Form”. Jurors fill and return the Verdict Forms within 6 days. If a judge does not fill a verdict form within 6 days, the form will be void. Verdict Forms must be filled in English. The Verdict Form has 3 components, 1. The Survey, 2. Sanctions and Resolutions. 3. Feedback. Jury members must fill all the 3 sections for their inputs to be considered during arbitration. Mediator will collect the filled verdict forms from the Jurors via Email. The verdict form can be seen at the bottom of this document. The Mediator will read all the responses and take an action based on aggregated suggestions. The decision of the Mediator shall be final. Parties agree to respect to this decision beforehand and to hold Mediator and the Jurors free from harm or liabilities that could arise due to the Mediation Process. Will be based on email using address support at adesignaward.com however we could potentially call and talk to the jurors as well as the Respondent or the Claimant. Therefore please remember to include all type of contact information when communicating a situation. 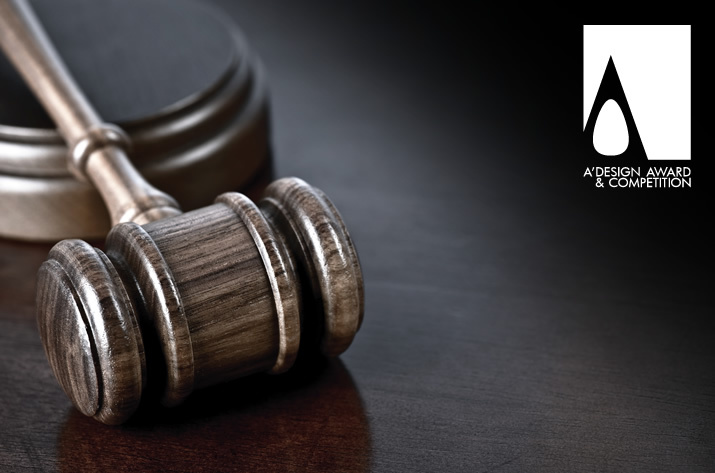 A' Design Award and Competition considers copyright and patents extremely important and aims to provide the best service to its participants as well as audience in order to ensure that rights are respected.